What's good about having a baby with Ds? I'm new here and I LOVE all the positive energy that comes from all of you. I think the best part of having a child with DS ( I have boy about to turn 16) is how much he has changed the world around us. He has such a wonderful heart and is so full of love and surprises that he changes the way people think and feel everyday, not just about DS kids...but about themselves as well. All of our kids make this place a better place to be. Wow!! All the babies sleeping through the night. Not John. He is almost 6 months, still waking up in the night. No bothers though. He is truly a great baby. I enter his room with " good morning sunshine." The biggest grin God has created pops up. That to me is better than that first cup of coffee. He is not a cuddler. It's so funny. When he is on his back, he will raise his head and feet and grunt like no other trying to get up. It's almost as if he thinks he grunts loud enough, he will get up and walk. I LOVE IT!! But I have a feeling I will be chasing this one everywhere. I don't ever want to forget. Love this thread!!! He made me realize what true LOVE really is! I have never felt love like I feel for Marlena. She may only be 2, but she is my best friend! She never stays mad at me too long, she has always been so good, never a tantrum girl, never tells my secrets, always wants to help clean the windows, coffee table, walls...etc. I can be in the kitchen cooking and she is perfactly content shreading the phone book or something like that, I swear for 20 mins or more. She is always perfactly willing to be my shopping partner when my husband refuses to go! 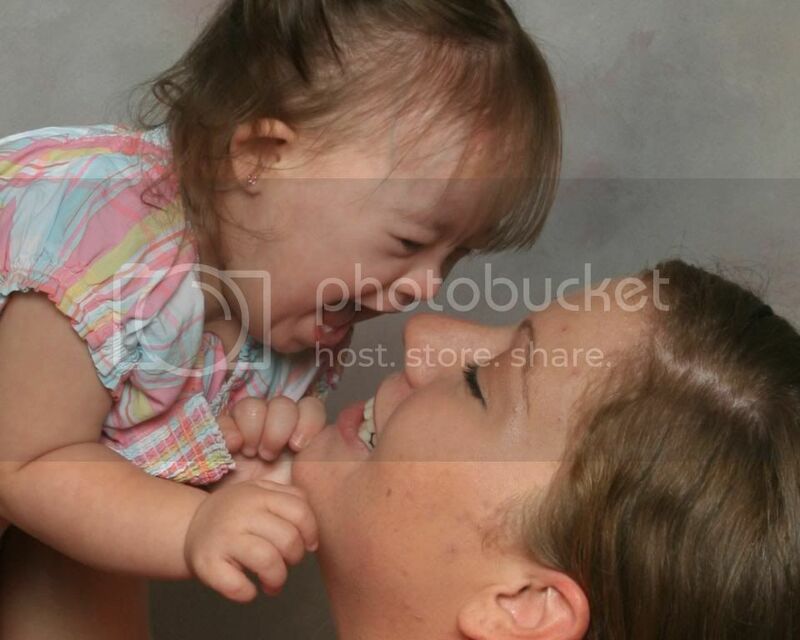 She has brought my family closer, in ways we love eachother more than we did before, and thats saying alot! She is a little charmer! people really can't get enuf of her. i think she is going to be a hairstylist! she always is brushing something and she tries like heck to put a clippie in her hair. The best thing ever about Marlena having Ds is that when the stereo types come out of people, she proves them wrong, she shows them that her "disability" is no disability at all, just a differnt ability. She is fabulous! Can't remember life before her! dont want to! I am a better person because of this wonderful blessing God put in my arms 2 years ago! We laugh like crazy about the silly things! I love you Marlena, Thank you God for giving her to me! Oh i forgot to mention, the people you meet, @ therapy centers, doctors, nurses, familys, therapists The people that will always leave a lasting impression, the people you probablly would have never met otherwise, yea totally worth it! Some of the compassion that you just dont see in America anymore! The good thing about having a baby with DS like SUGARBABYMARLENA said it has brought my sister and I closer, since we had not talked for 7 months. My Danika is an ANGEL sent to me to better myself and bring me closer to my family and husband. I am a better person because of her, I look at things in a different way. I don't take things for granted anymore. Danika sleeps all thru the night, hardly cries, only when she has a wet diaper or she's hungry. 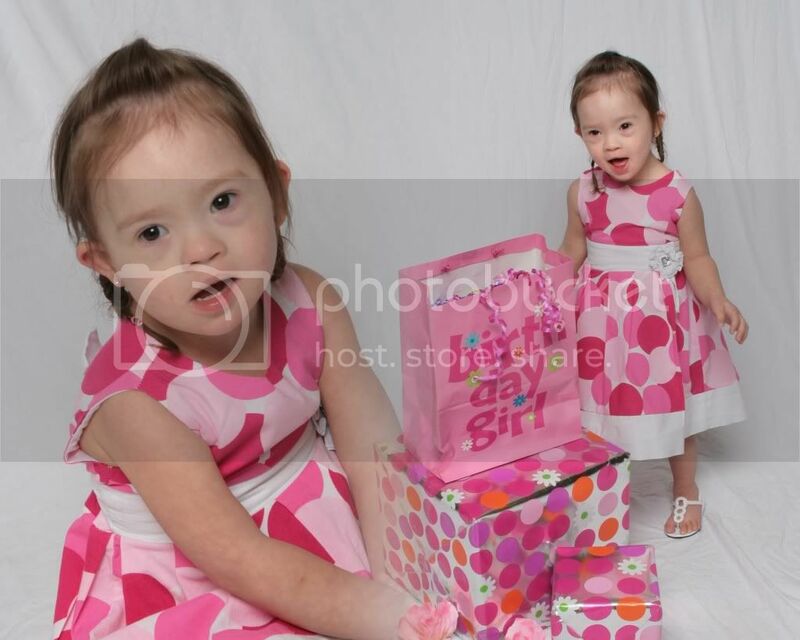 When she was born I did not know she had DS, I did not want to get any test done, because it was not going to change my mind, I would love her with all my heart. I did cry for 3 weeks because I didn't know much about DS, I was worried that she was not going to have a normal life like my other 4. I thought GOD had punished me. But I know now that GOD does not punish people, he sent me an ANGEL to make me and my Husband stronger. Hi, I'm new to this website and I just love it! My little girl was born with DS and she is 6 months old and the first time she smiled at me was the best feeling in the world. Chloe truly is the SWEETEST baby ever. She has developed her "attitude" but on the other hand is the most laid back baby ever. I really just wanna kiss her chubby cheeks and arms! I do have to say she makes the funniest sounds while she is sleeping and when she first wakes up! I just can't wait for her to put her arms out to me or when I walk out of a room to cry for me. May sound ironic but that's when my heart will totally melt! My lil' girl does the same grunting! It's like she is super woman trying to fly! So funny! I love it! Oh my goodness...where do you start? 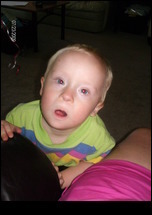 I found out very early in my pregnancy that Ian had ds. Of course, I had TONS of ultrasounds and got to see him lots before he was born. I had this incredible bond with him inside me and I couldn't wait to finally hold him in my arms. I would say the best thing is Ian's very silly personality. He can make our entire family laugh and his laugh is so infectious. Ian is also such a cuddler. Usually by 2, my babies are itching to become more independant...Ian loves to snuggle and I gobble it up as I know that will change one day. I also find Ian just touches anyone he comes in contact with. People just find him so sweet they just want to spend time with him. I love all my kids but there is really something special about Ian. 1) from the minute he was born, we instantly had a wonderful new family, a family of other parents and family members who have a child with Down syndrome and a whole new world of friends just becuase he has Down syndrome. To me this is awesome, I can get great advice on certain things about my son, Ive made new great friends because our children have Down syndrome. And also, when my son is sick in the hospital, he got GET WELL cards from ALL over the country, that was amazing, and its becuase we all have something in common. 2) My son has taught me more patience then ever, and Yes I know that all kids teach us patience, but when you are working for a long time for something through physical therapy like sitting up and it takes a while, it really teaches you patience. Or anything that comes as a challenge for Gideon, I learn patience with helping him accomplish some goals that may come easier for some kids. Some things he catches on quick but somethings he needs more help with. so that is a great thing Down syndrome has taught me, Patience, a virtue I never really had before my son. 4)I get soooo overjoyed when we work really hard at something and he accomplishes his goals. 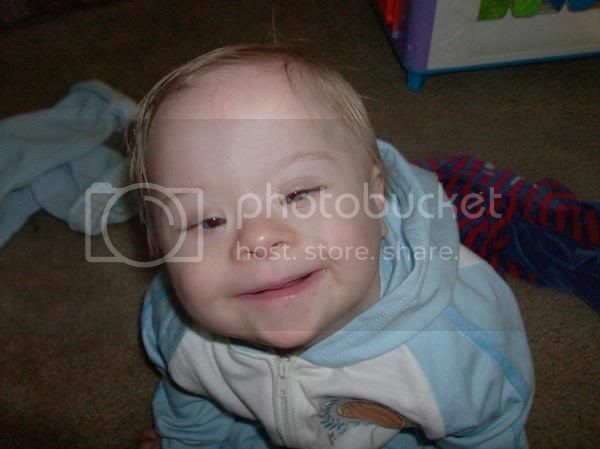 I think us as parents with children with Down syndrome really do feel more joy at times, I mean I balled when my son sat up all by himself, maybe its like that with other parents of typically developing kids, I dont know I may be being biased but He gives me more of a sense of accomplishment. I am so proud of him when he reaches his goals. Overall Gideon has showed me soooo much love and joy then I could ever have imagined, he loves to prove doctors wrong, he loves to do things at HIS own pace when HES ready for them and I love that about him, Becuase of my son who has Down syndrome, I have learned soo much about love and life and people. Its wonderful..... Yes I know the health problems that came along with him arent what I have wished for but you know what, these things have made me such a stronger person, a faithful person, and it has brought my family closer together. 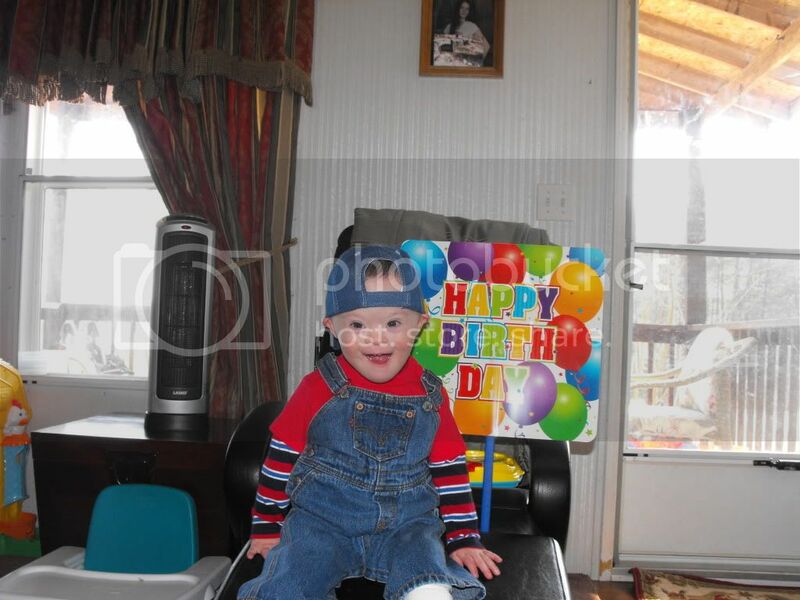 So, thank you God for my son Gideon, Down syndrome and all!!! It is really nice having a brother with Ds since he has a great sense of humor (yay). It would be really weird if he didn't have Ds, because it just wouldn't be him. I agree that this is a wonderful part of who Mikah is, though I'm not sure how related to Ds it is. I guess the instant community has been a wonderful aspect of him having Ds, but then I'm the sort of person who talks to nearly anyone. I'm also really enjoying that he's staying cuddly, at least so far. I'll never forget how Mikah as a baby would almost melt into me when we cuddled. He's also always had an amazingly infectious giggle/laugh. Then there is this... ever since Mikah was a baby it's been wonderful how so many conversations started just because someone noticed he had Ds. With Ds touching so many people because it's so common, I've heard some wonderful (and some very sad) stories. When Mikah was about 3 one man we met in a convenience store tearfully told me about the man with Ds who was the only person other than his family who made a point of welcoming him home when he returned from fighting in Vietnam. To think he still cried about it twenty-something years later moved me so much. He then bought Mikah an expensive toy truck as a gift. I felt funny taking it, but realized I was accepting for that man in his past. Two summers ago I also got to hear how a woman found out in her forties that she had an older brother with Ds. Her father had kept visiting him regularly despite her mother wanting to forget him and putting him in an institution as a young child. Now she keeps up the visits, and has arranged for him to be in a much better situation, monitors his medical conditions, and is working to get him whatever else he needs to be healthy and happy. What's good about having a baby with Ds? EVERYTHING.......although it might not be apparent straight away. It's a very grounding experience for everyone. Life doesn't have to be about perfection or who's better/cleverer/stronger/faster than the next person. It's about being happy and releasing all the negatives from your life. Easier said than done but when it happens it comes from a place of peace, serenity and acceptence. Happy 2010 everyone. I hope it brings everything your heart desires.